Maibach is a village in the Taunus mountains. The nearest airport is Frankfurt am Main (FRA). From there you can take the train, see below. Don’t confuse Frankfurt/Main with Ryanair’s Frankfurt Hahn (HHN), that’s quite far away in the Hunsrück mountains. Regional trains to Gießen via Butzbach depart from Frankfurt Airport station usually at hh:01 and hh:31. On sunday, there’s a connection to FRA about every 2h, e.g. Maibach 9:50, FRA 11:55. Next train station is Butzbach. There’s a bus connection to Maibach, line FB-54 (to Maibach) or FB-55 (to Bodenrod). There’s only one bus stop in Maibach. 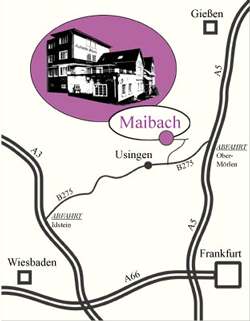 If you look for a connection on bahn.de (German Railways), give Maibach, Butzbach as destination, then you’ll get also the bus connection. Walk down the main road Alt Maibach . The big apricot colored house on the lefthand side is Maibacher Schweiz . The former main entrance is closed. Chose the road left of the building and go downstairs to the back entrance. Autobahn A5 to exit Ober-Möhrlen. Federal highway B275 in direction of Usingen. 3 km after Langenhain/Ziegenberg, turn right in direction of Maibach/Butzbach. After 4 km turn left into the village, down the main road Alt Maibach . Autobahn A3 to exit Idstein. Federal highway B275 in direction of Usingen/Bad Nauheim. 5 km after Usingen turn left in direction of Maibach/Butzbach. After 4 km turn left into the village, down the main road Alt Maibach . Autobahn A3 exit Bad Camberg in direction of Usingen. Federal highway B275 to Usingen in direction of Bad Nauheim. 5 km after Usingen turn left in direction of Maibach/Butzbach. After 4 km turn left into the village, down the main road Alt Maibach . The big apricot colored house on the lefthand side is Maibacher Schweiz . Turn left into the small road before the house, the parking area is on the righthand side. Go downstairs to the back entrance. We will try to help arrange for carpooling between attendees in due time.